At 1-800-GOT-JUNK?, we know you need fast, friendly, trustworthy service. We provide that and more. Our well-trained uniformed experts clean up after themselves at every job, then haul your e-waste away in a nice clean truck. No job is too big or too small. Whether you are clearing out a home, or refitting an entire office building with new electronics and need your old ones removed, we are here to help. Goodbye Junk. Hello Relief. There is no need for you or your staff to have to move items from where they have been used. Call 1-800-GOT-JUNK? to arrange a pick-up time that suits your needs. Our team will arrive on time, sort items to determine what can be reused or recycled, and then carry items out of the premises to load them and haul them away. You and your staff do not need to lift a finger, except to tell us which items need to be removed. We'll do our part to ensure your Las Vegas computer recycling and e-waste removal is pain-free for your employees, regardless of what floor you are on. Whether you are operating a large commercial warehouse, office building, school, medical facility, or simply cleaning out a private residence, proper e-waste disposal and computer recycling is important. Many of the smart items in your home contain circuit boards, call us today if you are disposing of old printers, scanners, tablets, laptops and other electronics, including smart TV's, furnaces, or dishwashers. We dispose of these items correctly to protect the environment as well as saving them from going into the landfills. Call 1-800-GOT-JUNK? to arrange your Las Vegas computer recycling today. We provide courteous, expedient service, and will ensure that your Las Vegas e-waste removal needs are our top priority. Since 2007 1-800-GOT-JUNK? 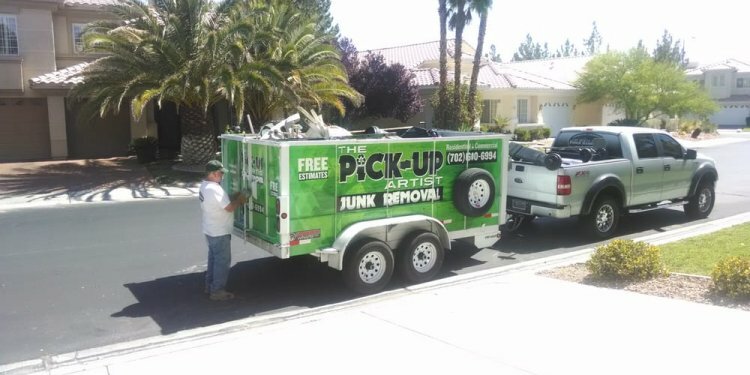 has been Las Vegas’ locally owned preferred full-service junk removal company. Our professional, friendly uniformed team members will help you remove your unwanted items from anywhere in the Las Vegas Valley. This includes Boulder City, Henderson, Lake Las Vegas, Blue Diamond, Mountains Edge, Summerlin, North Las Vegas, Nellis Air Force Base, and the fabulous Las Vegas Strip. No job too big or too small, from full office or lot clean ups, to single items like a mattress or old TV. Just call 1-800-468-5865 or book online and we will be out too quickly and efficiently give you your space back. Watch what we do.